Stylish design at Affordable Price. The unique metal-like finish quietly draws attention and naturally accentuates the picture. 2-in-1 Multifunction. When used on the table top, the multi-faceted frame leg enables a seamless transition between landscape and portrait display. When mounted on the wall, the hangers on the back allow both landscape and portrait as well. Improved Safety. The synthetic glass is shatter-proof and protects the picture from dust and erosion. No worries about broken glass when children play around! Remove the film on the glass before use. In addition, the frame leg has a restraining ribbon for over-stretching protection, which extends the product life. Top-of-the-line Touch Feel. When holding the frame, you can feel the softness of its velveteen backside and the smoothness of its front. 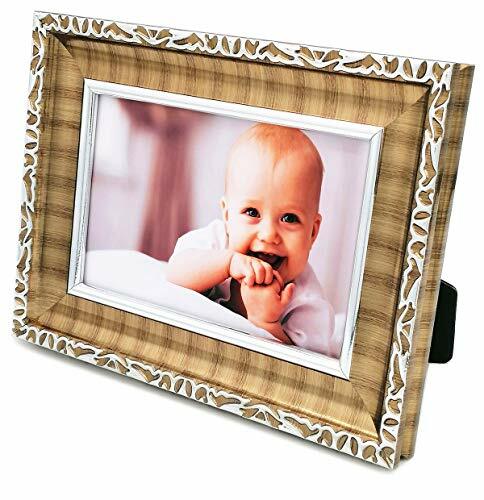 Your cherished memory not only looks good but feels nice! Earth-friendly material. This non-wood frame is made of polystyrene, a safe material widely used in food-service industry. Its production does not consume trees.